Something about corn makes my mouth water and dream about summer! Get your kids reading about this amazing maize. When is food more than food? When it is an intrinsic part of cultural development and identity. Corn is perfect for exploring how food can reveal cultural information about a population. 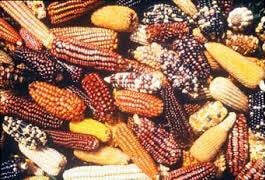 Have your students explore the origin of corn in Mexico and in the Latin and South American indigenous populations and compare their “corn” culture to the culture that has developed around corn production in the midwest of the United States. Are their similarities? Differences? Turns out that corn is the perfect crop to explore the concept of evolution and the role of both nature and human intervention in genetic diversity. For more ideas, check out this Teacher-Friendly Guide to the Evolution of Maize from the National Science Foundation. Corn is one of the easiest crops to cross pollinate - plant two rows of different seed varieties in close proximity so their silk appears at the same time, and the wind will do the cross pollinating for you - no birds or bees required. Try it out this spring, and see what you get in the fall. For more corn gardening tips, read here. What are biofuels? Send your students searching for the pros and cons of using corn as a renewable base for the creation of ethanol fuel. Does renewable always mean good? Are there balancing factors that must be considered? What are they, and at what point, if any, does it make sense to devote crop space to growing corn for fuel? Explore states of matter - solid or liquid? Cornstarch, a corn derivative, is the basis for one really fun and easy experiment to explore states of matter. Check out the directions, make some cornstarch “ooze,” and discuss Newtonian liquids with your students! This activity comes with a warning - do not dispose of the leftover ooze down the drain unless you have in in-house plumber! Let the water evaporate and toss the remaining cornstarch in your nearest compost bin! What can you do with corn? Turns out that you can do just about anything you want! Explore the many ways you can cook with corn - using it to make a flour as a base for bread, or creaming it for a soup or popping it for a snack or creating a heavenly pudding for dessert, this is one versatile food. We use its oil for frying, create a sweet syrup as a sugar substitute and use it to feed our animals. Have your students investigate corn’s nutritional value and their favorite ways to eat this American staple. Abstracts are short summaries of professional work that generally include the purpose and scope of the ensuing article. Take a look at this article about corn from Frontiers for Young Minds that is modeled on peer-reviewed journals. The article is prefaced with an abstract. Have students read the abstract and come to consensus on a working definition. Where will they find more abstracts? In peer-reviewed journals, which they will find in academic online subscription databases offered by their schools or through their public libraries. Have them explore this resource type and read through abstracts to identify interesting research on...corn!